Almost half the collection is British based, dazzling dress uniforms of the British Dragoons, Hussars, and Lancers stand at attention next to bandsmen’s uniforms from each of the five regiments of foot guards of the Household Division, more commonly known as the Life Guards. You may recognize the “Beefeater” regalia on a 1936 Yeoman Warder’s uniform designed for the men who guard the Crown Jewels located in the Tower of London. Visitors won’t be disappointed with the abundance of American military uniforms and paraphernalia gathered from all branches of the U.S. military. The museum carries a few Civil War items, including an original Union artilleryman’s jacket. The collection was the lifelong work of one man – the late Ronald V. J. Mountain. Mr. Mountain died in 1996 at age 68, and his wife, Pat, continues to run the museum. She is a knowledgeable and enthusiastic steward for this collection, and she’s happy to answer your questions. Take exit #191, this will put you on I-64 for 1 mile. Take exit #55 off I-64. Follow Rt. 11 south. As you go over the Maury River Bridge Rt. 11 will split. Merge to the right (Rt. 11 Business). As you come into downtown Lexington Rt. 11 will turn into Jefferson Street. Follow Jefferson Street to the end where it meets White Street Turn left on White Street and then turn left on Main Street. The Military Memorabilia Museum is on the right. From I-64, take exit #55. Follow Rt. 11 south. As you go over the Maury River Bridge, Rt. 11 will split. Merge to the right (Rt. 11 Business). As you come into downtown Lexington Rt. 11 will turn into Jefferson Street. Follow Jefferson Street to the end where it meets White Street. Turn left on White Street and then turn left on Main Street. The Military Memorabilia Museum is on the right. The street address is 122 1/2 South Main Street, down the brick walkway next to the Lexington Presbyterian Church. Visit the Lexington Web page about this museum to learn more about hours and phone contact. The image at top, from the London Daily Times, shows a line of Yeomen Warders in traditional uniform. 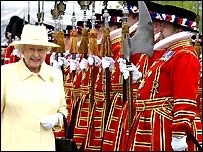 The second smaller image, from the BBC News, shows a happy Queen Mother inspecting her Beefeaters. 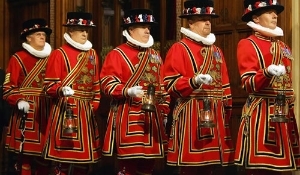 The Beefeaters date back to 1485 when King Henry VII formed a bodyguard. The news story for this link talked about the first female Yeoman Warder in history slated to join the troops. Read more about the 42-year-old Scottish woman who took her post in September 2007 as she wore the traditional dress of a scarlet and gold tunic, white ruff, red stockings and black patent leather shoes. The official title of a Yeoman Warder is, ‘Yeoman Warder of Her Majesty’s Royal Palace and Fortress the Tower of London, and Members of the Sovereign’s Body Guard and Yeoman Guard Extraordinary’. Phew!